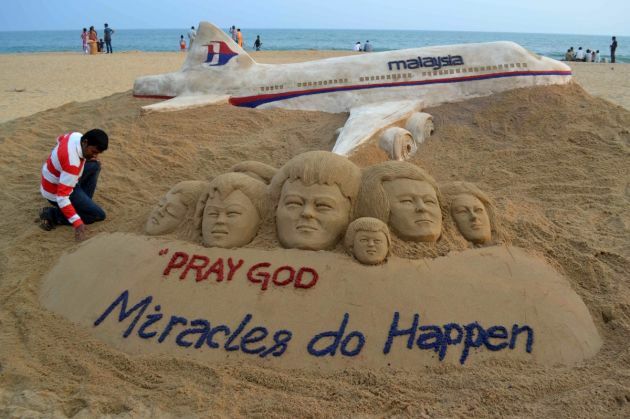 (Photo: REUTERS / Stringer)Indian sand artist Sudarshan Patnaik applies the final touches to a sand art sculpture he created wishing for the well being of the passengers of Malaysian Airlines flight MH370, on a beach in Puri, in the eastern Indian state of Odisha, March 9, 2014. PARIS, May 6 (Reuters) - European safety officials on Tuesday proposed tougher rules for 'black box' flight recorders in the strongest regulatory reaction yet to the disappearance of Malaysia Airlines flight MH370. The European Aviation Safety Agency (EASA) said it would propose increasing the recording time on cockpit voice recorders to 20 hours from two to make it easier to understand plane accidents and prevent vital evidence being overwritten. Newly published proposals would also bring into force recommendations made by French crash investigators after the loss of an Air France jet in the Atlantic in 2009, but which remain bogged down in talks among regulators. These include the addition of a new pinger frequency making it easier to locate the recording devices under water, where lower frequencies travel further. The proposals appeared in an opinion published by EASA on Tuesday and confirmed details reported by Reuters. They have been submitted to the European Union's executive Commission which will use them as the basis for a change in law. No trace of flight MH370 has been found since it vanished en route from Kuala Lumpur to Beijing on March 8, despite the most intensive search in commercial aviation history. Experts have narrowed the area where the plane is presumed to have crashed to a large arc of theIndian Ocean about 1,600 km (1,000 miles) northwest of the city of Perth in western Australia. The aircraft could have flown for up to seven hours after it went missing, meaning that even if the cockpit recorder is found, its standard two-hour recording loop would not cover conversations during the crucial early stages of the flight. "The proposed changes are expected to increase safety by facilitating the recovery of information by safety investigation authorities," EASA Executive Director Patrick Ky said in a statement. EASA also brought forward to 2018 a deadline for extending the battery life on black box emergency locator beacons to 90 days from 30. All passenger aircraft have two flight recorders - one for voice and one for data. Each is equipped with a beacon designed to start emitting signals as soon as it enters water. The extended battery life is so far the only recommendation from the three year-investigation into the Air France disaster to have won full support at the International Civil Aviation Organization (ICAO), a U.N. agency that coordinates safety standards. ICAO agreed to back the battery life change from 2018 but EASA originally gave European operators another year until 2019.